A group of unhappy PC gamers has launched an online petition pledging to purchase Crysis 2, while Crytek CEO Cevat Yerli says that despite the recent trouble with piracy the company remains committed to PC gaming. It's no great surprise that Crytek was annoyed by the recent leak of the upcoming Crysis 2 - PC version, naturally - to torrent sites last week, but they're not the only ones who are seriously cheesed off by the whole mess. A group of PC gamers tired of seeing their platform of choice stand as a whipping boy for piracy have taken steps to speak out against it, and in support of Crytek's new shooter. 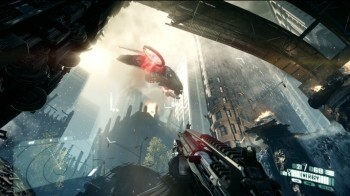 "In response to today's Crysis 2 beta leak, we who sign this online document pledge to purchase a legal copy of Crysis 2," the group wrote in a petition posted at GoPetition.com. "We also hope that this document shows that Crytek has a loyal PC fanbase that wishes to support their work, not rob them of it like the pirates who have constantly damaged our reputation as a gaming platform." That PC gamers are willing to stand up against piracy in support of a long-awaited game is the good news. The bad news is that after being online for a full day, the petition has garnered a little less than 300 signatures. That's not the kind of number likely to offer much in the way of reassurance to game makers in the midst of figuring out how much money they're going to lose to piracy this time around, but Yerli assured gamers that Crytek remains committed to the PC and that the support the company has received from the community is recognized and appreciated. "As you all have heard by now, an early, incomplete build of Crysis 2 has been leaked online. While we are deeply disappointed by these events, we are all completely overwhelmed by the support we have received from you, our community," he wrote in a message posted in the MyCrysis forums. "Despite this unfortunate incident, we can assure you that PC gaming is very important to us and will always be important to Crytek in the future. We are all still focused on delivering a great gaming experience to our true and honest fans. I hope you will enjoy Crysis 2 on PC, as we think it is our best PC game yet!" Crysis 2 comes out on March 22 for the PC, PlayStation 3 and Xbox 360.